Wahama sophomore Emma Gibbs (7) attempts a spike during the Lady Falcons setback to Federal Hocking on Thursday night in Mason, W.Va.
Wahama sophomore Harley Roush (4) attempts a serve during the Lady Falcons setback to Federal Hocking on Thursday night in Mason, W.Va.
MASON, W.Va. — Another tough night for the Lady Falcons. 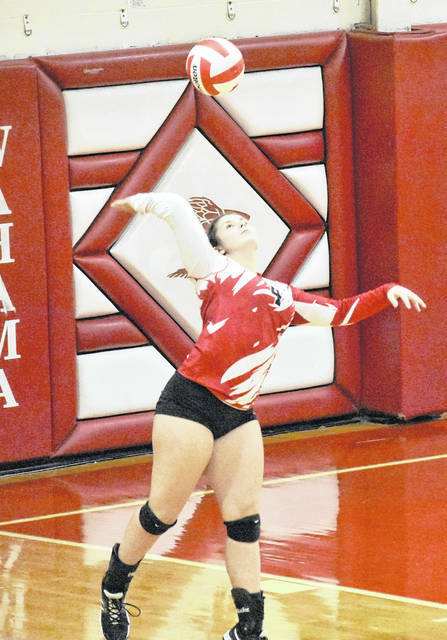 The Wahama volleyball team suffered a three games to none setback against visiting Federal Hocking on Thursday night in a Tri-Valley Conference Hocking Division match at Gary Clark Court in Mason County. The Lady Falcons (2-12, 2-12 TVC Hocking) jumped out to an early 4-0 lead in the opening game, but the Lady Lancers (9-9, 6-5) rallied to close to tie the contest at 4-all. From there, FHHS never again trailed in the contest, as it closed out the set on a 21-10 scoring run en route to a 25-14 win. The second game was tightly contested as the two squads played to five ties before becoming knotted at 9-apiece, but Federal Hocking utilized a 7-1 scoring run to widen the margin to 16-10. Wahama manufactured a 10-6 scoring run to narrow the deficit to 22-20, but the Lady Lancers scored the net three points in the set to close out a 25-20 victory. The third set heavily favored Federal Hocking, as they charged to a 7-1 advantage early in the contest. 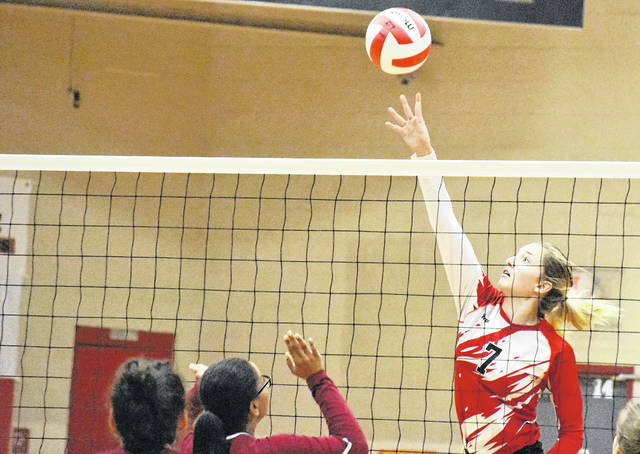 The Lady Falcons were able to narrow the margin to 10-6, but the visitors utilized a 15-11 scoring run to take a 25-16 win and 3-0 match victory. The Wahama service attack was led by Harley Roush with six points, as Gracie VanMeter and Bailee Bumgarner followed with five service points apiece, respectively. VanMeter also had one ace in the contest. Alexis Mick and Hannah Billups were next for the Red and White with three points apiece, as Mick finished with one ace. Logan Eades rounded out the WHS service attack with two points. Emma Gibbs paced the hosts at the net defensively, as she accounted for all five of Wahama’s blocks in the match. As a team, the Lady Falcons finished with 96 digs and 15 kills. For the Lady Falcons and ninth-year head coach Matt VanMeter, the game was an opportunity for his team to learn from their mistakes. “We do a lot of things right,” VanMeter said. “But we are still doing a few things wrong. Improving in those areas comes with experience and we are still a fairly young team. We are having some difficulty reading the ball and moving before our opponent hits the ball. The girls have to work on being stopped and moving a bit too late out there on the floor. It’s difficult to make accurate passes when you’re still moving and trying to hit the ball. “I think we did well at the front of the net,” VanMeter said. “We had several blocks. I think that’s another area we will as the girls get more experience. I think as the girls continue to work on hand placement we can get a lot more, but I’ll take what we got. We also to remember we we do get a block, to come down and be in position to play the ball. Too often we have times when we get tips and the ball comes back behind us at the net and they drop through. Makayla Brown paced the FHHS service attack with 11 points, while Lindsey Parsons and Jaylen Rogers followed with eight points each. Abby Jackson was next with seven points, while Jordan Knapp followed with three service points. Chloe McCune concluded the Federal Hocking service attack with two points. The victory for the Lady Lancers served as a season sweep of WHS, having earned a win on Sept. 13 in Stewart, Ohio. Up next for the Lady Falcons, a road date with Tri Valley Conference Hocking Division foe Eastern.